Continuing our trip to LA with this post. One of the places I was most excited to visit when there was Malibu – the wide stretch of blue ocean water looked really beautiful from the pictures. So on one of our days, we decided to go take a short road trip to Malibu. The drive itself is breathtaking. You drive along the Pacific Coast Highway and the coastline is picturesque. The road is elevated so it appears like a bridge over/along the water. Make sure you drive with your windows down so you can feel the warm ocean breeze and taste the salt in the air. 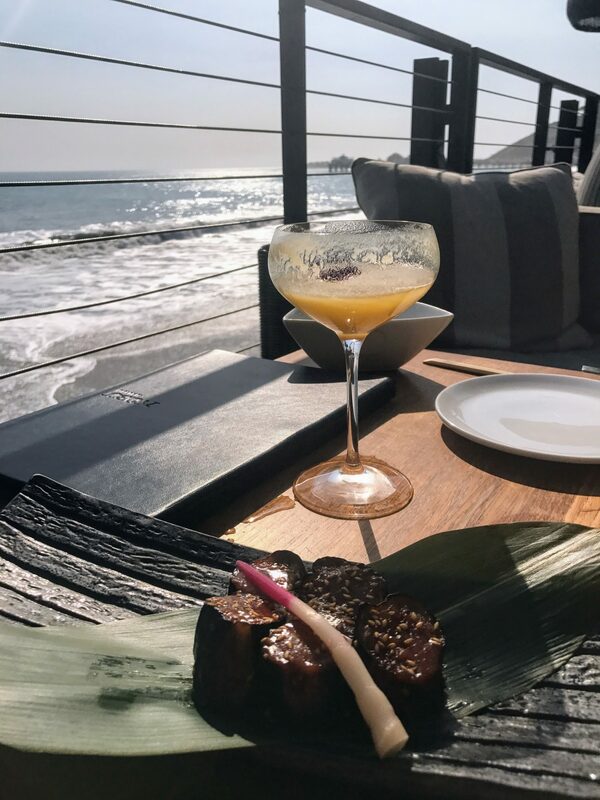 Once in Malibu, we headed to Nobu for lunch. We had made reservations 3 weeks in advance of our trip because we know how busy this place is! We had asked for an ocean side seating and even though they can’t guarantee it at the time of reservation, they were able to offer it to us when we arrived. The place was packed, as expected. 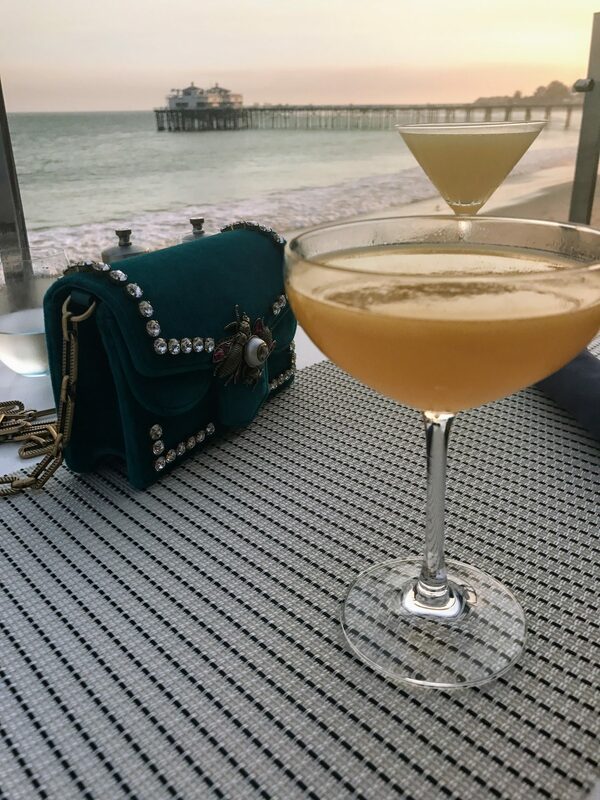 It is a huge restaurant and offers quite a few ocean side tables but arrive at least a few minutes before your reservation so you can get a table with a good view. The waves literally crash against the wall of this restaurant and you can see the pier from your table. It’s hard to explain the feeling. 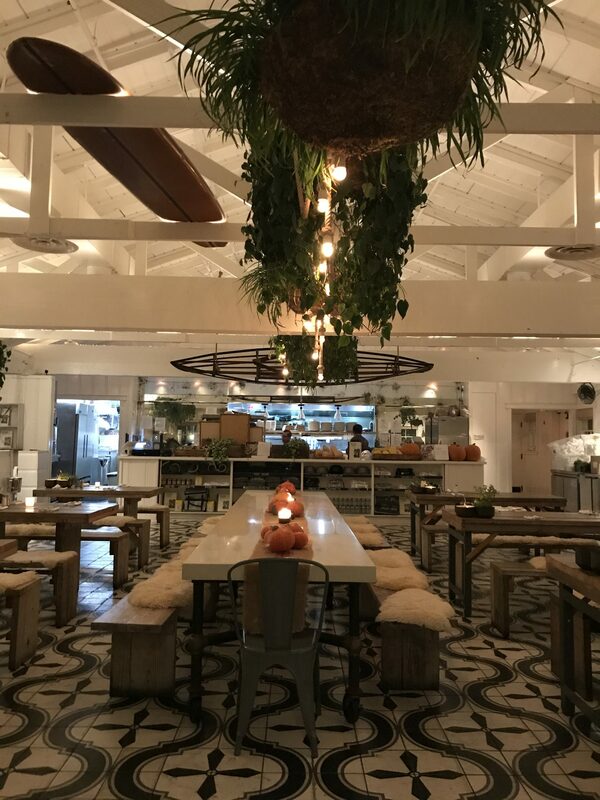 The staff mentioned their only hesitation with giving us the table that was available was there may be too much direct sunlight….are you kidding haha we do not complain about that! We don’t get nearly enough sun here in Toronto! We ordered some drinks to start. I had the Mango & Passion Martini and Joel had the Sapporo. I lapped up that drink so fast because it was so delicious and then I ordered the Lychee Martini 🙂 For apps, we ordered the Eggplant Spicy Miso, Edamame, Roasted Cauliflower, Crispy Okra with Garlic Ponzu and Grilled Shisito Pepper. My favourite was the Crispy Okra so we reordered that one more time as we went through a second round of drinks. We absolutely meant to order some rolls and sushi but were so full from the drinks which somehow kept on coming (wink wink)! All in all, we stayed for a few hours just soaking up the sun, enjoying some great conversation together, cuddling and watching the waves rise and fall. After which, we headed towards the pier to watch the evening surfers. 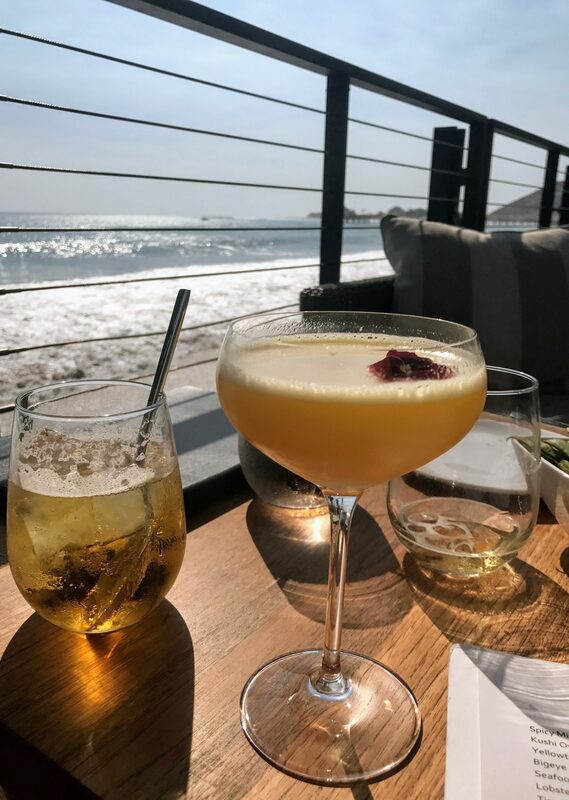 We stopped at Malibu Beach Inn on the way for some more drinks in their famous Carbon Beach Club restaurant overlooking the pier again. 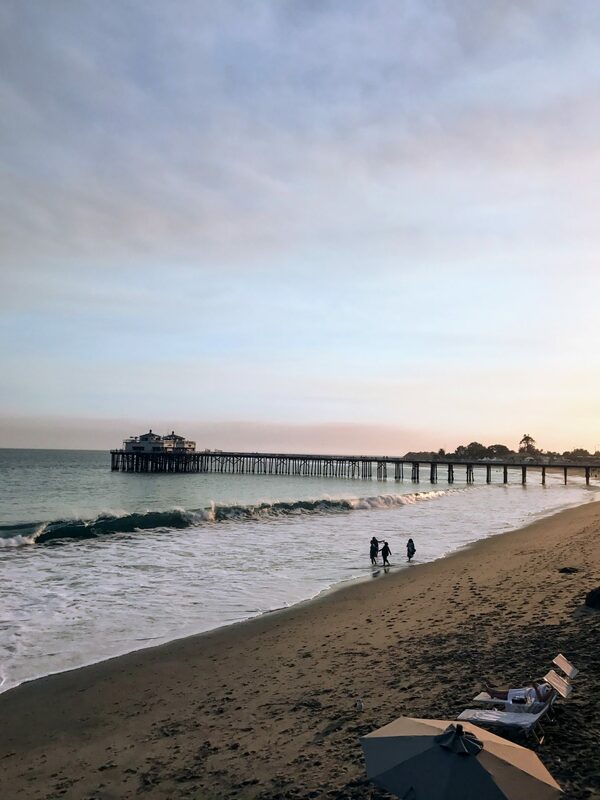 We walked along the beach, hand in hand, and found a great spot to spread some beach blankets, take a mini nap and go in for a quick dip in the ocean just before sunset. 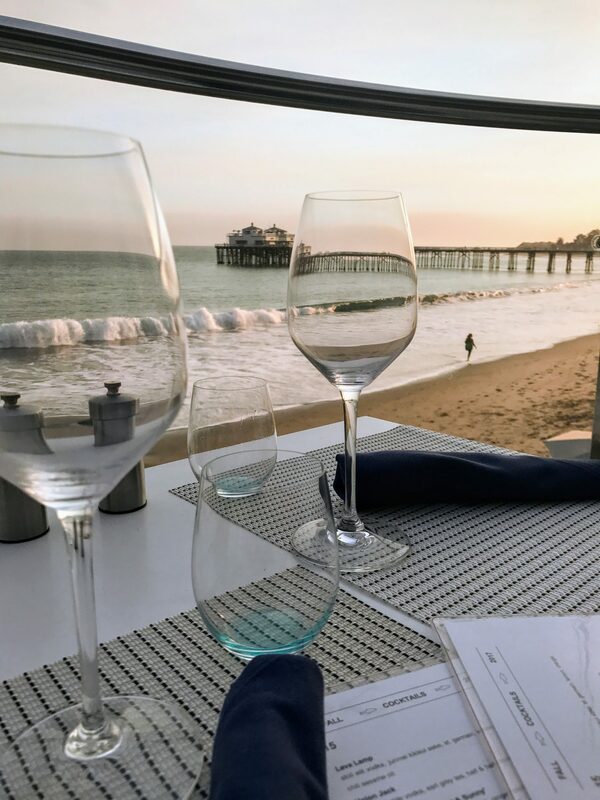 It was a perfect day and just when I thought it couldn’t get any better we landed on the pier and found the cutest spot for dinner – Malibu Farms. They serve farm to table fare, all the veggies used are fresh and organic and all in all, it looks like you are in a fancier, bigger and more organized version of your grandma’s kitchen with cosy decor, cascading greens, pretty lights and yes, blankets to make it extra cosy when the temperatures drop in the evening. We ate the Malibu Blue Nachos and Cauliflower Crust Pizza for apps and I ordered the Spaghetti Squash Lasagna for my main while Joel ordered the Ratatouille Orzo. The lasagna was probably the best I have had in my life. Who knew spaghetti squash could be used in a lasagna recipe!